Valpak can deliver your brand’s message to a targeted audience in the Boise area each month, doing so affordably thanks to our cooperative mailing system. Because multiple companies advertise in our Blue Envelope each month, the cost of reaching tens of thousands of households is made affordable to businesses of all sizes. We create custom ads in the form of single-panel coupons, multipanel coupons, circulars, unique imprinting, flyers and more – you choose the format! Mailboxes are just one avenue into the homes and hearts of local consumers. As a Google Premier Partner, Valpak of Idaho has proven its ability to help small and midsize businesses grow through online marketing services. Our digital marketing packages can help you reach consumers at home, on the go – before the sale and after it. Valpak of Idaho is a full-service marketing agency that can extend your reach to qualified households across the region – including communities such as Boise, Nampa, Meridian, Caldwell, Garden City, Eagle, Star and others. Call us today to see how we can help your local business thrive. For specific dates and coverage, contact your Valpak of Idaho representative. 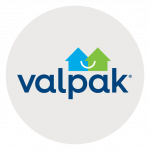 Valpak of Idaho is an independently owned Valpak franchise.